Ceramic Tile Removal: What are All of My Options? Ceramic tile: a dated classic that may be haunting your home with flashbacks to days when your flooring was actually white. You’re having visions of how spectacular your home would look with a traditional and timeless option like wood or bamboo flooring, but what are you going to do with all of that ceramic tile? Well, you have a few options to getting your home prepared for a new floor installation. You can either attempt to remove the flooring yourself, hire a home labor service, or choose a floor removal specialist like Dustbusters. There are pros and cons to each ceramic tile removal option, and considering all of your options before making a decision may be in your best interest! The obvious benefit to DIY ceramic tile removal is the savings. But, for someone inexperienced with floor removal, the process is draining and time-consuming. Also, the entire process may be more costly than you may think. For instance, all the tile that you rip up has to go to the trash, but the garbage truck will not pick up demolished ceramic tile. This will cost you the additional fees of hiring a trash related service or help transferring tile to the dump. If you have lots of time, energy, help, and resources removing ceramic tile yourself is possible. But, if you would rather save your back and time, you can invest in either hired labor or professional floor removal. If bending over for days scraping, pulling, and hauling ceramic tile doesn’t seem like the ultimate weekend plans, you can always hire laborers to do it for you. Of course, there is still the added cost of disposal fees or the hassle of transferring loads of heavy tile in your vehicle, but you won’t have to do most of the labor yourself. 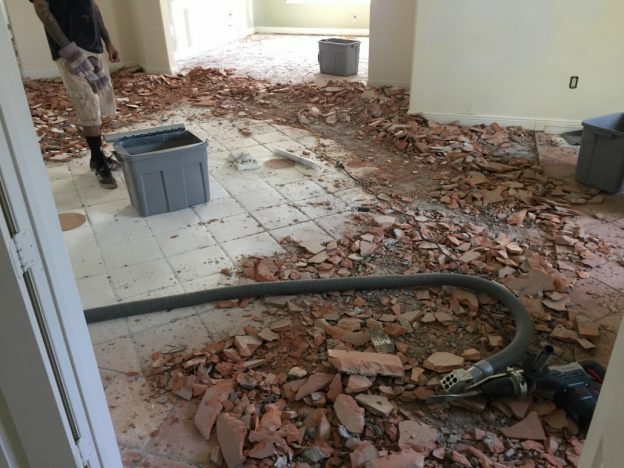 One of the biggest problems with DIY tile removal or hiring laborers to remove tile is the creation of construction dust. Without innovative technology, removing tile secretes pounds of dust into the air that your family, friends, and pets breathe in. This dust contains harmful silica particles that can lead to the development of lung diseases such as cancer. It also is extremely fine, meaning that it takes days or even weeks to fall, giving you a house that requires frequent dusting until all of the dust finally falls to the ground surface from out of the air. If you are looking for the most bang for your buck, consider hiring a professional floor removal service that offers innovative dust-free equipment like Dustbusters. We can get residential projects done in a single day, giving you the time you need to get your project done on time and without the exerted energy of doing it yourself. Our dust-free method of floor removal eliminates the safety hazard dust places on your loved ones and also leaves you with a home that is not filled with dust! Lastly, included in our pricing is flooring removal, so you won’t have to worry about dumpster rental or moving tons of tile to the dump! Ready to get your floors ready for a beautiful new installation? Call us today for a free consultation at 866-883-8783.